Trifle is one of my favorite desserts. A big bowl of trifle looks really pretty, but once it's served it looks a bit of a mess. So I always make individual trifles, even though the big bowl is quicker to make. Trifle, as we know it, dates from the mid-1700s. The English carried it over to America, and it's very popular in the South. It's made up of layers of cake (moistened with sherry or something else), jam (and/or fruit), custard and whipped cream. I always use pound cake, but you can use another cake. And I always use either strawberry or raspberry, jam and/or berry, but you can use any kind of fruit you prefer. But, please, no tinned fruit! A homemade egg custard is best, but I know people who--and I try not look shocked-- use packaged (gasp!) puddings. I know it's the height of summer, but I'm giving you my Winter Trifle, so called because I make it with strawberry freezer jam, giving us a taste of summer any time of year. I would not use a store-bought jam for this. Tell me about your favorite trifle! In top of double-boiler, whisk together sugar, flour and salt. Whisk in egg yolks, then milk, until thoroughly combined. Cook, uncovered, over boiling water, whisking constantly, for about 10 minutes, or until thickened (should register 160 degrees Fahrenheit on instant-read thermometer). Remove from heat; stir in vanilla. Whisk for 2 minutes until custard has cooled a bit. Place pan in large bowl of ice water for 10 minutes, stirring occasionally. Proceed with trifle recipe. 1 Make stirred custard. While custard is cooling, cut half a loaf of pound cake into eight slices not more than 1/2-inch thick; cut slices in half. Measure out the triple sec or orange juice and jam. You might want to use two teaspoons of liquid (one of triple sec and one of orange juice) to moisten each slice of cake. I use just one simply because my husband has an aversion to "soggy" and prefers things on the drier side. 3 Chill trifles for at least 8, or up to 24, hours. Not optional, this is a must. 4 When ready to serve, make the whipped cream. 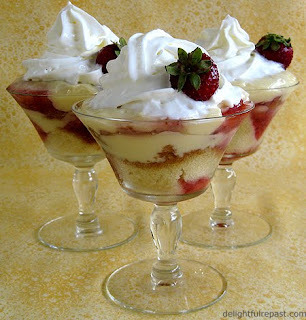 Put about 2 tablespoons whipped cream on each trifle; garnish each with a small strawberry with stem. This is what the insides of jelly donuts become if they die and go to heaven. Looks as good as it sounds. No doubt tastes as good also. I really have to quit eating desserts in the dark... Hmmm. DESSERTS IN THE DARK. Good title for my recipe book of sinful sweets. Thanks, Sully. In the quick and easy bachelor version of this dessert, you could use a 10.75-ounce Sara Lee All Butter Pound Cake cut into 16 slices. I tried it! My family can't believe that I made it! I am a real "hit" with them. Delicious! Wonderful! I'm so glad you tried it and liked it. This looks simple enough for me to tackle. Normally I: open box and stick in microwave. Thank you, Vic. You CAN tackle it. The jam is super easy--make it one weekend; freeze it. The cake is easy--make it the next weekend; eat half, freeze half. Then thaw jam and cake a day or two before you want the trifles. Eight to 24 hours before serving, cook the custard (easy), assemble the trifles, chill. Hi Jean - Thanks for the comment and the suggestion on my Austen blog. The trifle definitely looks much more palatable and I'd be happy to give it a try! By the way, thanks so much for stopping by my blog the other day! =) So Fun to meet you! Jean, your trifle recipe sounds delightful (and it's beautiful to look at, too!). Looking forward to reading through some of your other posts, including the one with "Jane Austen Comfort Food" ;-). Chris and Stephanie -- Thank you! I hope you'll give it, and more of my recipes, a try. Friday I'll be posting about pancakes! Marilyn, if you truly do "have an unhealthy attachment to carbs," come on back to The Delightful Repast! I'm all about comfort food. hello! thanks for the jumbo marshmallow tip - those things look AWESOME. as well as that trifle; it's (almost) too pretty to eat! Those look wonderful! I have a friend who is waiting (and waiting and waiting) for me to get a Regency-period dress made for her. If I ever get around to that dress, we'll have to celebrate with a trifle! Lionel is still blushing about the comment you left at Cranberry Morning. ;-) He is one sweet guy. I'll have to write a special blog post about him one of these days. Thanks for taking the time to comment. This sounds absolutely delicious! I wish that I had some right now. Thanks, Melanie. I wish I had some right now too! These trifles look invitingly delicious for any time of the year. You've beautifully presented them! I'm glad you like them, Cristina! Hope you'll make them soon. I just +knew+ you'd have a good recipe for an English trifle. Am making it tomorrow morning for an afternoon tea, in pretty etched sherry glasses! Natalie, thank you so much for having confidence in me! Do let me know how they turn out for you. And spare no details about the afternoon tea - I love hearing about afternoon teas almost as much as I like being there myself!